19 x 18.4 mm. Thickness 3.3 mm. 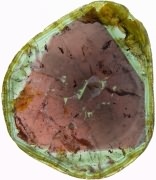 24.7 x 18.8 mm. Thickness 3.9 mm. 17 x 15.3 mm. Thickness 2.6 mm. 63 x 51.1 mm. Thickness: 4.5 mm. 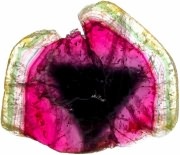 »» Pair slice ¦ Green Sl.¦ Tourmaline data Growth zoning in a tourmaline crystal.